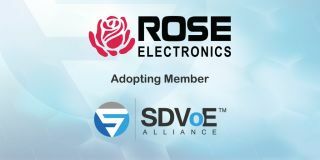 Rose Electronics has joined the SDVoE Alliance as an adopting member. "We’re looking to SDVoE technology to enable us to deliver products that take full advantage of the flexibility and scalability of Ethernet without compromising the quality and performance the industry has come to expect from us," said Peter Macourek, general partner, Rose Electronics. "We believe that our KVM switching and extension experience over the last 35 years positions us to package our solutions based on the SDVoE platform in a manner that ensures that our customers receive an unrivaled experience and set of capabilities." Rose Electronics will be exhibiting at DSE in Booth 1116, NAB in Booth SL11121, and InfoComm in Booth 2061. "We’re excited to meet with customers at all of the upcoming tradeshows and discuss our vision and product roadmap,” Macourek concluded.